I’ve promised to write more about my work in progress, The Age of Pisces. But where to begin? What to say about such a large project? I can start with the title. The Age of Pisces is a reference to the astrological age that is still current (for despite the song from Hair and other references from pop culture, the Age of Aquarius is still some way off). But what exactly is an astrological age, and how do we know we’re in one, and how do we know when it begins and ends? Oh: and what does it mean anyway—why should we care? The mainstream understanding is that the “precession of the equinoxes” was discovered by the Greek astronomer Hipparchus between about 147 and 130 BC, although I’m convinced that the discovery was much, much earlier than this. The equinoxes are the 2 points on the celestial sphere where the celestial equator intersects the ecliptic. The celestial equator is simply the imaginary circle formed on the sky by projecting the Earth’s equator onto it: imagining the plane of the equator intersecting the spherical shell of the sky. The celestial equator is what’s known as a great circle, which is a circle drawn on the surface of a sphere that has its center at the center of the sphere. So a great circle is always a circumference of the sphere—the largest circle that can be drawn on a sphere. The ecliptic is another great circle, but this one is formed by the intersection of the plane of Earth’s orbit on the celestial sphere. The celestial equator and the ecliptic are different circles because the axis of the Earth is tilted with respect to its plane of orbit. If the axis were not tilted, then the celestial equator and the ecliptic would be one and the same circle, and there would be no intersection of circles and therefore no equinoxes. Earth’s orbital plane is defined by its path around the Sun. This means that the Sun is always, by definition, on the ecliptic. As Earth goes around the Sun, the apparent position of the Sun in the sky (that is, against the background of fixed stars) changes. In the course of a year it moves all the way around the sky, returning to the place where it started (that is, to the place where we started observing it a year ago). And because Earth’s orbital period is about 365 days, which is close to the number of degrees in a circle (360), the Sun travels, on average, about 1 degree each day along the ecliptic. Now because the ecliptic and the celestial equator are both great circles, when they intersect they cut each other exactly in half. And since the equator is the circle that conventionally divides the Earth into northern and southern halves, this means that half of the ecliptic is above the celestial equator—that is, north of it—and half of it is below—that is, south of it. This in turn means that the Sun, traveling along the ecliptic, spends half the year north of the celestial equator and half the year south of it. In the northern hemisphere where these observations were originally made, the time of the Sun’s passage north of the celestial equator corresponds to the seasons of spring and summer, when the days are longer than the nights, and its passage south corresponds to autumn and winter, when the nights are longer than the days. But in this annual cycle of growing and shrinking days there are 2 days when the lengths of day and night are the same. These are the days when the Sun, following the ecliptic, crosses the celestial equator, once on its way north at the beginning of spring, and once on its way south at the beginning of autumn. Loosely we call those days the equinoxes (a word that derives from the Latin words for “equal” and “night”), but more strictly the term applies to the points on the celestial sphere where the ecliptic and the celestial equator intersect, and the Sun crosses these points not over the course of a day, but really at a specific moment in that day (if you choose one point to represent the Sun, such as its center). This is what allows astronomers to declare that spring or autumn begins at an exact time of day each year, and more generally it allows more precise measurements to be made of the Sun’s motion altogether. When we track the motion of the Sun through the sky over a year we say that it returns to the same place, but what is it that makes a place in the sky the “same”? There is only one way of locating anything in the sky, and that is with respect to the background of fixed stars. In the ancient world it was observed that while the stars moved through the sky each night, as did the Sun during the day, they moved en masse and did not change their positions with respect to each other. This made them different from the Sun, Moon, and other classical planets, which did change their positions with respect to each other and with respect to the stars around them. Indeed our word planet derives from the Greek planes, which means “wanderer,” a reference to exactly this property. So the fixed stars act as an unmoving grid against which the motions of the planets, which in ancient times included the Sun and Moon, can be tracked. And this is what astronomers have done since remote antiquity. If we’re measuring the progress of the Sun through a year, and we decide to make our starting-point the spring or vernal equinox in March, then we will know that the Sun has returned to its starting-point when it returns to the same position among the background of fixed stars as when it started. This in turn implies that the vernal equinox itself is a fixed point in the sky, exactly like a star, sitting permanently at a fixed distance from other nearby stars. What Hipparchus is credited with having discovered, though, is that the vernal equinox (and therefore also its counterpart across the sky, the autumnal equinox) is not fixed after all. Very slowly, it moves. That is, over the course of years, decades, and centuries, the vernal equinox shifts against the background of fixed stars, gradually changing the stars in its immediate neighborhood. In doing this it is said to precess, and this continuous, slow motion is called the precession of the equinoxes. In the fullness of time the equinoxes precess all the way around the sky, returning, eventually, like the Sun in its annual course, to the same point in the sky, that is, to the same spot among the fixed stars. But while the Sun does this in one year, the equinoxes take about 26,000 years to do it. It is thought that because this motion is so slow, it takes more than one lifetime of good astronomical record-keeping to be able to see it, and that is why it was not until the time of Hipparchus, who had access to such good records, that it was discovered. And the same could be said for an equinox. This imaginary point in the sky moves, like a planet, along the ecliptic through the constellations of the zodiac, spending about 2,200 years in each one. Each of these 2,200-year transits of the vernal equinox through a zodiacal constellation is termed an astrological age, and takes its name from the constellation of the transit. 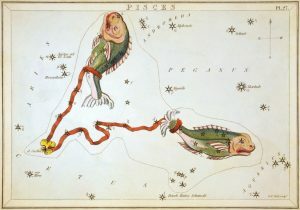 Using certain special ideas and techniques, some ancient astronomers declared that in 7 BC the vernal equinox entered the constellation Pisces, and thus inaugurated the Age of Pisces. If they were right, then the vernal equinox is still there, making its way backward through the constellation. It’s almost over the border to Aquarius, but not quite. By this reckoning, it won’t get there until about AD 2170. So maybe we can see the dawn of the Age of Aquarius, but we still live in the Age of Pisces. It’s late in the age, but Pisces it still is. And what does that mean? If you’re a modern astronomer, chances are it means nothing; the ideas and nomenclature of astrology are relics of a superstitious time. It’s mere inertia that causes the modern astronomer to still refer to the vernal equinox as “the first point of Aries” and to symbolize it with the astrological glyph for Aries. But I disagree with that view. I say that it does have meaning. Astrology is a valid field of definite knowledge that can enrich the life of anyone who takes the time to study it. I’ve studied it myself over the last 35 years or so, and there is not the least doubt in my mind as to its validity. Furthermore, I have my own idea of why it works, but that will be for next time. This entry was posted in astrology, thoughts and tagged astrology, Astronomy, Hipparchus, how astrology works, precession of the equinoxes. Bookmark the permalink.